2015. 10. 02. 2015. 10. 02. Hungarian-Romanian cooperation costing millions of Euro has provided roads which go nowhere, through a complex system of public procurement and sub-contracting. Somewhere along the line, the need for border checks was forgotten and as a result border crossings are unchecked and therefore unpassable. The roads worth millions of euros act as playgrounds and keep fit tracks, but fail to attract any actual traffic of note. Within the Hungary-Romania Cross-Border Co-operation Programme 2007-2013, millions were spent on building roads that lead nowhere. The total comes to at least 23 million euro, though other sources put the final price tag as high as 55 million. Cars are seldoms seen on the roads, and the rationale and practical use of the roads are questionable. During fieldwork, we found ourselves in a series of absurd situations: for example, at Elek (HU) police officers checked our IDs when we wanted to see where the road, built using EU funding, ends. In Hungary, the biggest contractor in the road building programme was Duna Aszfalt Kft, a company which really started to prosper shortly after the Fidesz government came to power. In fact, few have heard of the Hungary-Romania Cross-Border Co-operation Programme (HURO CBC). There are townships where the roads have been repaired through this programme, using millions of euros, yet nobody has actually heard about the programme itself. And because these projects rarely made it into the news, it was fair for people to assume that they were implemented without problems. This turned out not to be true. Since accession in 2004, Hungary has received net support of 23bn euro from the European Union. This is a huge amount of money, enough to build 1,842 Felcsut stadiums (a high profile and controversial project promoted by Hungarian PM Viktor Orban, a dedicated soccer fan). The situation in Romania is similar. Since its accession in 2007, the country has received about 20 bn euro, despite the fact that its absorption rate is a meagre 60%. The money from Brussels is distributed through a number of sub-programmes. Many of these attracted a lot of attention, largely because billions of euros were paid through these programmes. For example in Hungary, the Environment and Energy Operational Program (EEOP, in Hungarian KEOP) had a budget of 4.3 bn euros. However, while the sub-programmes with big budgets received much public attention, smaller budget EU programmes like the 7-year Hungary-Romania Cross-Border Co-operation Programme (HURO) operated without much publicity. The goal of the programme is the development of the border areas. To be eligible, applicants from Romania or Hungary had to build partnerships in the other country. The program had a total budget of 215 million euros from the European Regional Development Fund (ERDF). Our investigations focused on the construction and communication tenders of projects financed through the HURO programme. We focused on these two aspects because our past experience showed that these are the two areas where dodgy deals and cases of corruption are most likely to occur. 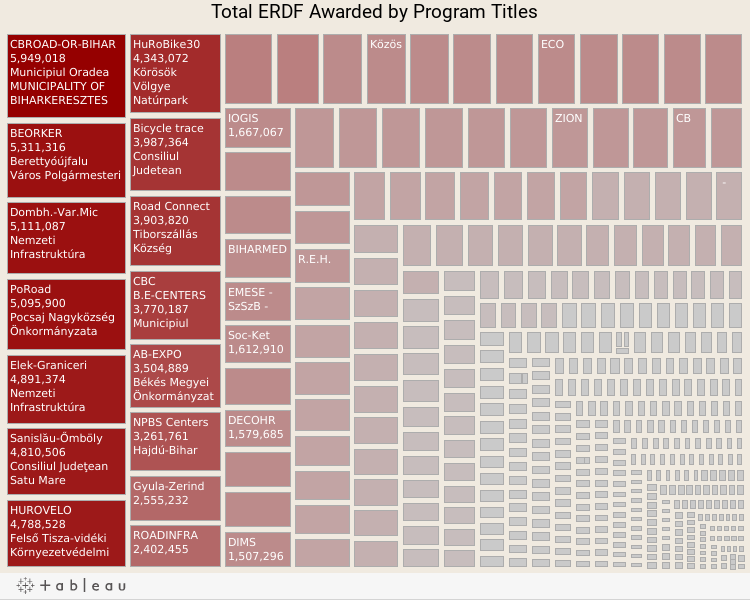 We sifted through more than 300 public procurements, filed FOI requests with 40 public authorities, and conducted background interviews with politicians, businessmen and experts who know the programmes from the inside. All our sources asked for anonymity. The first call for proposals for the HURO programme was published in October 2008, amid political turmoil in both countries. As the economic crisis reached Hungary, the Hungarian government sought help from the International Monetary Fund, and PM Ferenc Gyurcsany announced austerity measures. Romania was also struggling with the effects of the economic crisis, as PM Emil Boc introducing drastic cuts. In the first round, 85 projects received a total of 13 million euros in financing. The stakes were much higher in the second round: the budget was 101 million euros. The third and fourth rounds had more modest budgets: with expenditure of 16 and 18 million euros respectively. 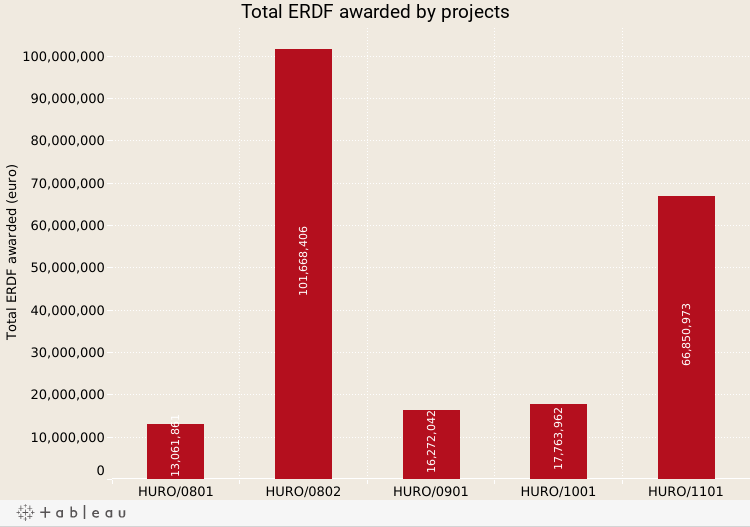 The fifth and last round saw increased budgets: successful applicants received a total of 67 million euros from the ERDF. The project required a partnership between Hungarian and Romanian organisations. On the Hungarian side, there was a compulsory 5% contribution; for the Romanian side, this was 2%. Often the awarded projects were not implemented directly by the partners: they contracted some of the works to private companies. From 2010, there were hundreds of public procurements regarding the HURO programme. The Managing Authorities (MA) of the two countries signs contracts with the lead partners of each of the projects. Nevertheless, we were told by the contracting officer that the MA has no overview of the public tender process for the execution of different parts of the projects. This level of implementation is supervised by the First Level Control (FLC), which works under the national authorities. If everything goes well with the project, FLC issues a declaration to validate the expenditure. Based on this document, the lead partner prepares the payment request. The Managing Authority and the Joint Secretariat receive only the project-level payment request. The managing authority does not verify the submitted documents: they rely on the declaration validating the expenditure, issued by the FLC. Not every project progresses smoothly. The problems and irregularities are reported, then checked by an audit authority. The European Commission also receives reports about any problems. In Romania, the Ministry of Regional Development and Public Administration (MDRAP) told us that 15 projects with problems and potential irregularities were identified. In three cases, no financial loss occurred, because the problems were discovered before payment. In nine projects, MDRAP discovered irregularities related to public tenders. In one case, there were problems with the settlement of accounts, and there is one case with suspicion of fraud and forgery. Also there is one project which was believed to have been plagiarised, simply copied word for word from a different project. In Hungary, the Prime Minister’s Office reported 45 irregularity proceedings linked to the HURO programmes which started between 2007-2013. All these cases are now closed. The majority of irregularities were connected to breaking the public procurement and co-financing laws, as well as breaking the rules regarding double financing. Within the programme, the biggest projects were those related to road construction. Of the projects which won the most financing, two are road building projects. A road between Oradea (RO) and Biharkeresztes (HU) received 5,95 million euros, another road between Dombegyház (HU) and Variaşu Mic (RO) was awarded 5,1 million euros. The total budget of the first of these projects was 13 million euros, and of the second was 6,2 million euros. We visited some of the road construction projects, and were astonished at what we found. Our first stop was a road in Pocsaj (HU), a town close to the Romanian border, where we saw a project with a net worth of 2,1 million euros. The road starts near the houses of the local Roma community. As there were no fences, the kids were running freely and playing in the road. In fact, we had to be very careful not to cause an accident. Our visit came to a quick end: after driving towards Romania for a few minutes, the road suddenly disappeared. We had no intention of travelling off-road, so we turned back. This project started at the beginning of 2011, and according to the website of the HURO programme, the inauguration was planned to take place on 31 December 2013. In reality, the cornerstone on the Hungarian side was placed in April 2014. On the other hand, the road on the Romanian side, starting from Rosiori (RO), was already finished in February 2012. On the Romanian side, the contractor was SC Drumuri Bihor SA. This company is owned by the Bihor county (RO) council and Selina SRL (the latter has the majority of shares). Let’s return to Pocsaj, our first stop. According to local media, the road was planned for completion by 15 August 2014. However, for a large portion of the road, only the foundations have been prepared, and there is barely any asphalt. The contractor built part of a bridge on the Er canal, but it cannot yet be used. When asked about works carried out since April 2014, the mayor of Pocsaj said that there has been both road and bridge construction. The old asphalt was removed, the water ditches were built, they laid the foundations of the road, and geodetic work was finished. Similar to Pocsaj, the Dénesmajor road was also an unexpected cul-de-sac. The difference being that here we hit a concrete barrier instead of a field. The road was built by Duna Aszfalt Kft. for 384,000 euro. At Elek, we had yet another absurd experience. In the township two companies, Duna Aszfalt and Swietelsky, built roads for 1.8 million euro. At the end of the road which crossed the border we met two policemen who had orders to check the IDs of people driving on the road. We were no exception, so we had our IDs checked. When we thought the situation couldn’t get more bizarre, two elderly women appeared, happily riding their bicycles. They said that they are very glad that this two-lane road was built as there is barely any traffic, and the whole area is so quiet it is ideal for cycling or walking. They come here three times a week, to workout. On the other side of the border – except for the police – we found a similar situation. The Romanian partner of Pocsaj was Rosiori (RO), Denesmajor’s (HU) partner was Zerind (RO), and Elek (HU) had a road construction project together with Graniceri (RO). As with our first examples, the roads built using EU funds between these townships are either closed or go nowhere. The three projects above received 12.6 million euro from the EU, with a total budget reaching 14.7 million euros. For this amount, six, totally useless roads have been built. And this is only the tip of the iceberg, there were many similar projects. The road between Körösnagyharsány (HU) and Cheresig (RO) was 2.4 million euros, the Garbolc (HU)-Bercu (RO) road costed 1.2 million, the road leading from Sanislau (RO) and Ömböly (HU) was 5.7 million euros. These roads cost a total of 9.3 million euros, yet have no practical use. The reason is simple: Romania is not yet a member of the Schengen area. Therefore border checkpoints need to be installed on any road crossing the border between Romania and Hungary. This is why every road we visited was blocked, and this is the reason for the presence of the police officers at Elek. We talked to a mayor who had lobbied for a border checkpoint for years. His township had no money for this, and he failed to obtain financial backing from elsewhere. The mayor believes a checkpoint could be installed relatively cheaply, for 100-150,000 euros, bringing the expensive road across the border into use. ‘At the beginning of the project, it seemed a credible perspective that Romania will become a Schengen member by the time the road is completed’ – said Gyula Kecskés, the mayor of Pocsaj. If the situation changes, the road will be useful. The mayor said that there is an understanding between the two states about the opening of a transitory checking point, but as yet there are no immediate plans to put this in place. Nevertheless, Kecskés was also positive about the road projects. He said that the road between Dénesmajor (HU) and Zerind (RO) is used regularly not only by agricultural vehicles, but also by hunters, border guards and trekkers. When the building of the road started, everyone was convinced that Romania would soon become a Schengen member, so we were told. In fact, sometimes the border crossing is temporarily open, and there is plenty of lobbying for a border checkpoint. According to the Pocsaj mayor’s office, there actually aren’t any major financial or technical blocks to establishing a checkpoint, it’s just that the Romanian government does not support the initiative. A source working at the Commission told us that the European Commission finds it problematic that 8 new roads and 2 soon to be completed roads under the HURO/CBC programme cannot be used. The problem is that Romania’s Schengen accession is delayed, so border checkpoints need to be installed on these roads. A bilateral agreement was signed between the two countries on 24 July 2014, solving a previous problem regarding the legal basis for constructing the last part of the roads across the common border. However, a problem remains since Romania is not yet in the Schengen area, and a temporary solution must be found to open border-crossing points. The Hungarian government sent a proposal to Romania describing the legal and technical requirements for making cross-border crossings operational. So far it appears that the Romanian side has rejected this proposal but has not proposed an alternative solution. Hungary sent a letter on 23 December 2014 to DG Deffaa informing him of this situation, asking the Commission to prompt the Romanian government to seek a solution. In the context of the HURO/CBC programme that financed these roads, the Commission has stressed that although output indicators were deemed fulfilled (kilometres of road built, expenditure validated according to the national legislation and authorisations issued by the relevant authorities), the long-term impact and result outputs foreseen by this programme have not been met, with no prospect of achieving the relevant outcomes in the near future (number of people with improved cross-border accessibility reaching a target set at 1 million). This makes the projects vulnerable to internal and external audits, and it exposes public funding – both at EU and national levels – to critical reputational risk (total cost of the roads is around 55 million euros). In the new programme for 2014-2020, no new roads will be funded until this issue is resolved, our source said. So far, only the contractors have profited from the new but useless roads. They had nothing to lose; they received payments regardless of their usefulness. 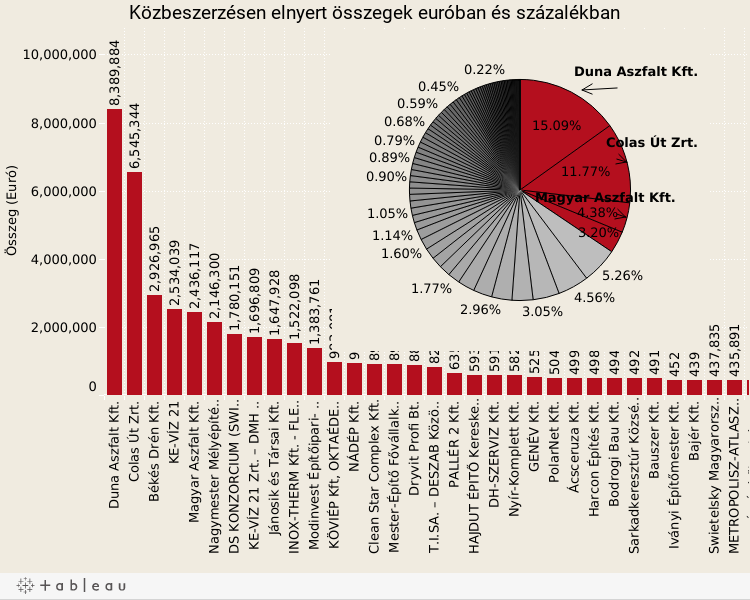 One year ago the Hungarian internet portal, Index.hu collected information relating to the companies which win the most public procurements. Four companies from this list of 20 – Duna Aszfalt Kft., Swietelsky Kft., Colas Zrt. and Magyar Aszfalt Kft. were also big time winners in the HURO/CBC programme. These companies won tenders worth 20 million euros, approximately a third of the money disbursed through public procurements from the Hungarian side. The rest of the 35 million euros was shared between 80 different companies. Duna Aszfalt won contracts worth 3 million euro, the largest of all the different contractors. Then as a member of a consortium with Swietelsky Kft., they won another 1.8 million. The company was involved in two of the projects investigated by us: at Elek (HU), they contracted the work together with Swietelsky, at Dénesmajor (HU), they worked alone. As part of the HURO/CBC programme, they also built roads in Dombegyháza (HU), Körösharsány (HU) and Csanádpalota (HU). The company was contracted for all these works under the current Fidesz government. In fact Duna Aszfalt Kft. has done remarkably well since the Fidesz government came into power in 2010. Since then, Duna Aszfalt tripled its revenues (from 60 to 180 million euros), and increased its profits almost tenfold, from 1.4 million euro to 13 million euro. The company won parts of the renovation of the arboretum in Felcsut (this arboretum is operated by a foundation with ties to PM Viktor Orbán), although it should be stressed that there was no competition for the tender. Duna Aszfalt received the second biggest credit line, worth 16 million euros, from Magyar Fejlesztési Bank. One of the directors at the company is Balázs Pálffy, the boyfriend of the daughter of Lőricz Mészáros, a close friend of PM Viktor Orbán. It is not only the big road building projects which raise questions. We were perplexed by the street enhancement project in the Hungarian border town of Berettyóújfalu. Together with Osorhei (RO), the township won a 2,8 million euro project which aimed to renovate 4 streets, each of them with a direct connection to the international E60 road going from Hungary to Romania. While the renovated streets at Osorhei connect with the E60, the ones renovated in Berettyújfalu (HU) seemed to be picked at random and without any direct connection to the main road. We could not determine any logic to the choice of streets. Furthermore, the Berettyóújfalu mayor’s office were unwilling to offer any answers, as they wanted to review the whole article, which we considered out of proportion with the information we were requesting from them. This article was developed with support by Journalismfund.eu.